When Reese is forced to go on a boating trip with his family, the last thing he expects is to be shipwrecked on an island-especially one teeming with weird plants and animals. 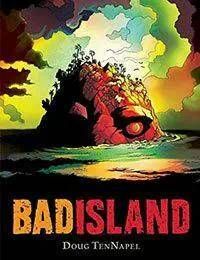 But what starts out as simply a bad vacation turns into a terrible one, as the castaways must find a way to escape while dodging the islands dangerous inhabitants. With few resources and a mysterious entity on the hunt, each secret unlocked could save them... or spell their doom. One thing Reese knows for sure: This is one Bad Island.